By 1992, thousands of pilgrims visiting the Conyers apparition site were drinking water from the well located on Nancy Fowler’s property. By the end of 1998, the estimated total attendance at the apparition site was over 1.3 million persons. Most of the pilgrims and drank water from the Holy Well and collected it in containers for home use. On some 13th of the month apparition events, the well was in constant operation from early morning until evening. Over the 8 years of the apparitions, many thousands of gallons of this Holy Well water were collected and transported to pilgrims’ homes throughout the United States and Northern Mexico. The pilgrims would use the holy water to give to their friends at home for blessing themselves and religious objects---and for drinking. “Go very deep. Five hundred feet is not too deep. It will be difficult to use the same spot. “I am not pleased that you short changed Me. I am going to make you work now. Children, there are many people who do not like Whom you stand for. “You must be careful. “If you mix wells [by trying to drill the existing well deeper] then you get dirty water. Let all who come drink of My water. “You must be very careful. The days are coming when you will be able to trust very few people." 1. The first Holy Well on Nancy Fowler’s property was operational by hand pump when she purchased the house. 2. The first Holy Well could not supply the water necessary for the increasingly large crowds of pilgrims. 3. A second Holy Well was eventually drilled about 20 feet away from the original well. 4. The first drilling contractor used poor technique and broke the seal on the first well and mixed the water from the two wells. 5. The second drilling contractor for the second well sealed the first well and completed drilling on the second well. 6. The second well was drilled to a depth of 600 feet and was capped and sealed by a professional well-drilling company. 7. A surface reservoir and a hand pump were removed in 1993. Water was then obtained from the first well from spigots operating under pump pressure. 8. Over an 8-year period (1990-98), a large number of the 1.3 million pilgrims who attended the apparition site consumed massive quantities of the water from the first Holy Well. 9. The water from the first Holy Well is presently being consumed on a daily basis; not only by adults, but by children. The water has been, and remains, untreated. 10. There have been no known reports, ever, of any illnesses ascribed to this Holy Well water. From pilgrims, there have been thousands of written reports of healings at Conyers with and without using the Holy Well water. The reports are with the Archbishop of Atlanta. 11. At present, the Holy Well remains closed to the public. 1. Shallow wells collect water from veins closer to the surface and are more easily contaminated. 2. Unsealed wells are more likely to be contaminated than sealed wells capped with concrete. 3. There are literally thousands of domestic water wells in most states in the U.S.
4. Supplying drinking water to homes by private well is a widespread rural practice. Untreated rural well water is preferred by many to treated city water. 5. Many cities mix well water with purified water from treatment plants. 6. Coliform bacteria exist in the intestines of all humans and animals. 7. Coliform bacteria exist in nature; as human and animal waste exist in nature. 8. Coliform bacteria are in the effluent of every septic system and can contaminate any nearby well. 9. It is not unusual to detect coliform bacteria, at random, from any untreated well. 10. Only certain strains and/or concentrations of coliform bacterium are toxic. If these certain strains and/or concentrations are ingested, they immediately produce flu-like symptoms. If this happens, suspension of use of the water and notification of health officials is highly recommended. 11. If small children are drinking private well water, the water should be tested as per local health department regulations, as children are more susceptible to coliform infections. 12. Domestic family wells usually do not, by law, require testing. The faithful say the water is holy; the scientists say it's contaminated. Rockdale County health officials have asked Nancy Fowler the Conyers-area woman who claims to see recurring apparitions of the Virgin Mary, to post a sign at the well on her property stating that the water may be contaminated. Mrs. Fowler and her associates invite the thousands of monthly visitors to the apparition site near her home to take samples of the well water, which Mrs. Fowler has said was blessed when Jesus Christ made an appearance to her. However, a sample of the water tested last May was contaminated with coliform bacteria. The Health Department's environmental health supervisor, Carey Fuller, wrote last September asking Mrs. Fowler to post a warning at the well. Mr. Fuller said Mrs. Fowler's well is not considered a public water supply, and thus is not subject to county or state regulation. Mrs. Fowler’s spokesman, Bob Reynolds, was not available Friday, but during an earlier discussion he said visitors are discouraged from drinking the water. While holy water is not drunk as part of any Catholic ceremony, it is sometimes sprinkled on a person or object, and people have been seen drinking the well water. Thomas Smith, a spokesman for the Georgia Environmental Protection Division, said his agency tested the samples submitted by Rockdale County officials. The presence of coliform bacteria indicates that the well water is "unsatisfactory for drinking," he said. Such water could cause diarrhea or stomach cramps, he said, and the effects could be more severe for someone who drank the well water and was already sick. The warning noted in the above AJC February 15, 1992 article was indeed posted at the Holy Well. This author, a licensed medical technologist (MT(ASCP)BB), remembers reading the issued and posted 1992 testing report in 1993 and is able to confirm that “coliform bacteria” were detected. Also, this author remembers, specifically, no mention of any toxic strain of coliform bacteria listed in the testing report posted at the Holy Well. In the above article from the AJC, ­Mr. Smith of the G.E.P.D. neglected to say that detection of low concentrations of coliform bacteria in drinking water is not a violation of clean water standards. This fact will be adequately substantiated in the following paragraphs. That seemed to be the end of it. However, in 1993, an estimated 511,285 pilgrims (greatest number for any year of the apparitions) visited the apparition site. Almost all of them visited the Holy Well and drank the water---as the laboratory testing report remained posted for all to see---without any reported illnesses. As far as this author can remember, the water in the Holy Well was never tested again for contamination after the initial 1992 testing that resulted in the posting of the testing report. “The reports of Nancy Fowler’s alleged visions of the Virgin Mary and the messages Fowler said came from her ushered in a phenomenon like nothing Rockdale County has seen before or since. · 1. “Fowler’s apparitions in Rockdale County began in September 1991, and continued on the 13th of each month through 1994. Gatherings of the pilgrims were thereafter held intermittently at the White Road location, which became known as The Farm, until October 1998. At that time the housewife-turned-appartitionist announced she would cease to announce the messages she received from the Blessed Mother from the steps of her small house overlooking Ga. 138 in north Rockdale County. “The gatherings attracted thousands (estimates ranging from 2,000 to 80,000) who flocked to Rockdale County via tour buses and private automobiles. The weather was never a deterrent. Umbrellas were the only protection the pilgrims had from the sun and rain and most were ill-prepared for the cold weather. During the blizzard of 1993, temperatures plunged and the snow fell, but still they came – many in T-shirts and sandals. Hotels were booked to capacity months in advance, restaurants were overwhelmed, and traffic was a nightmare during the gatherings. · 2. “And even though both the Catholic Church and the Monastery of the Holy Spirit issued sanctions against the gatherings, apparently no one heeded them. An organization known as Mary’s Little Helpers Inc. offered a three-day pilgrimage package to believers ranging from $127-$157 per person. · 3. “the Environmental Protection Division later found the well to be contaminated with E.Coli. Many proclaimed their rosary beads turned into pure gold while praying at The Farm, and a host of followers came in hopes of experiencing the same good fortune. · 4. “Perhaps one of the greatest miracles to occur at The Farm was the appearance of reams of typed copies of the Blessed Mother’s messages minutes after Fowler allegedly received them. In July of 1992, Fowler revealed that she sometimes received the messages before the 13th. “Financing the operation was Bob Hughes who purchased the land adjacent to Fowler in 1992 in order to accommodate the rapidly growing number of visitors to The Farm. Other sources of income included the publishing of the messages, books and newsletters which were sold to the faithful worldwide. After May 13, 1994, the date of the last monthly apparition, Our Loving Mother appeared to Nancy in five annual “Fatima Anniversary” apparitions, beginning on October 13, 1994 and ending October 13, 1998. The word “apparitionist” suggests the employment of magic (magic is considered by Christian theologians to be of demonic origin) and does not appear in Webster’s Dictionary. The correct term is “visionary”. Paragraph 2. No “sanctions” were ever issued by the Catholic Church against the apparitions. In 1992, then Archbishop James P. Lyke, due to a volunteer situation beyond Nancy Fowler’s control, issued a severe cautionary letter to the Catholic bishops of the United States on the apparitions. It proved to be an overreaction. The issue was resolved and the new Archbishop, John F. Donoghue, started a clean-slate relationship with Nancy, et al, in 1993. The Monastery of the Holy Spirit, in Conyers, except for a few dissenting monks, always had a supporting relationship with Nancy. A Cistercian monk from Holy Spirit Monastery, Father Joachim Tierney, became one of Nancy’s closest spiritual advisors. As far as this author can remember, no group named “Mary’s Little Helpers, Inc.” was ever officially associated with the apparitions. This was probably an out-of-town support group. Paragraph 3. Both the AJC and this author’s recollection of the posted laboratory test result specifically refer to coliform bacteria and do not mention E. Coli as being detected. “Pure gold rosary beads”: Frequently, pilgrims would have the chain links in a rosary turn a golden color. There was never any claim of “pure gold” rosary beads. Along with other physical signs that were given, the phenomenon of the gold-colored links actually happened hundreds of times throughout the years. The Archbishop of Atlanta has, in his archives, many files of letters of testimony from pilgrims; testimonials of spiritual and physical healings. The occurrence of ‘signs of sight’ were of minimal importance at the apparitions. The most grace-filled signs were the conversions of the human heart to the Sacred Heart of Jesus and the Immaculate Heart of Mary. Pilgrims that were away from the Church for decades returned to Jesus. Paragraph 4. The allegation of “reams” of messages being handed-out immediately after Nancy received a message from Our Loving Mother comes from a source of complete misunderstanding and concomitant fabrication. The earliest that written copies of the messages were available were the on the day following the apparition in the “Information Center” where a single typewritten copy of the previous day’s message was photocopied and handed-out to pilgrims. The thousands of pieces of print that were given to the pilgrims, on the day of the apparition event, were copies of the latest “General Information” sheet, or the Conyers “Journal”. The “General Information” sheet was printed weeks or months in advance. The Conyers “Journal” contained only messages from previous apparition events. Regarding Nancy receiving messages “before the 13th”: Occasionally, Jesus, in a message to Nancy, would give the subject matter His mother would speak about during her upcoming 13th apparition. Nancy has never received a 13th-of-the-month message from Our Loving Mother before the 13th. In the eight years of the apparitions, Nancy received many hundreds of messages from Our Lord and Our Loving Mother. Only a very small number of these messages were received on the 13th of the month. Paragraph 5. Along with what has been presented so far, and, with the documentation that is to follow, it should be clear that the water in the Holy Well is, and never was, “polluted”; as the above Rockdale Citizen article states. As to the water being “holy”, this author has witnessed a physical healing that I ascribe to the water in the Holy Well---blessed by Jesus. A young man brought his mother, almost totally incapacitated with chronic obstructive pulmonary disease (COPD) to the apparition site at the Holy Hill (the site of the Holy Well) in a wheel chair. He told me that her legs were so swollen (probably from congestive heart failure) that she could hardly walk to the bathroom in the motel room. He stopped at the Holy Well and filled a bottle with the water and then proceeded to the Holy Hill where the Rosary was being prayed. He and his mother joined the other pilgrims in prayer. He was then moved to take some of the water from the Holy Well and rub it on her swollen legs. Later, he told me that, after the Rosary was prayed, she got up out of her wheel chair and walked the ¾ block back to his car. He also told me that his mother had been sitting up most of the night before, suffering from shortness of breath. This author personally observed his mother walking around the area where the young man’s car was parked. 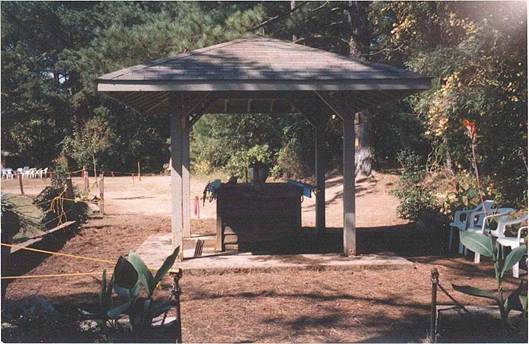 Over the years, there have been many other spectacular testimonies to the healing powers of the water from the Holy Well at Conyers. These testimonies remain in the office of the Archbishop of Atlanta. water, then 500 samples of treated water are collected each month. water in Atlanta is tested for 150 potential contaminants. 5.0% of monthly samples = 500 x .05 = 25 samples per month in Atlanta contain coliform bacteria in drinking water after treatment. This represents 3.1% of the total drinking water in the distribution system in Atlanta. These bacteria are “naturally occurring” coliforms and do not pose a health risk. Turbidity and nitrates from “fertilizer runoff” were found and posed “no” health risk “violation”. (average 5 per month) are “naturally present” and represent no health risk. Cryptosporidium is a parasite that enters lakes and rivers through sewage and animal waste. It causes cryptosporidiosis, a mild gastrointestinal disease. However, the disease can be severe or fatal for people with severely weakened immune systems. EPA and CDC have prepared advice for those with severely compromised immune systems who are concerned about Cryptosporidium. “What are the health effects of E. coli O157:H7? The author made a telephone call to the Georgia Environmental Protection Division Drinking Water Testing Laboratory on March 02, 2005. It revealed that electronic records of any drinking water testing were initially stored by electronic means beginning in mid-1993. A ten-year limit is in place for the storage of paper testing reports, which would mean that the February, 1992 laboratory testing report on the water in the Holy Well at the Conyers apparition site would have been destroyed during 2002. The Georgia E.P.D. Laboratory employee further stated that if E. Coli bacteria are detected in a municipal water sample, the municipal authorities are required to issue a “boil water directive”. In addition, the E.P.D. Laboratory is required retest the water “five (5) additional times”. (Presumably until the E. Coli bacteria are no longer detected.) These stringent measures reflect that the detection of E. Coli in well water (private or municipal wells) is a serious and health-threatening situation. There was no communication between the Rockdale County authorities and Nancy Fowler or the persons supporting the apparition site that reflected a water contamination problem as serious as E. Coli contamination. The conclusion is, that, since the New Holy Well was drilled in early 1993 and the coliform bacteria were detected during or before February of 1992; that the coliform bacteria were detected in water from the First Holy Well , before the time of the early 1993 drilling of the Second Holy Well.